Welcome to Elwood Toy Library's catalogue. Members can login to check toys on loan, book party packs and the cargo bike, and choose roster shifts. If you'd like to become a member of the toy library, register to join or visit us during opening hours. We're at the rear of the Elwood/St Kilda Neighbourhood Learning Centre at 87 Tennyson Street in Elwood. 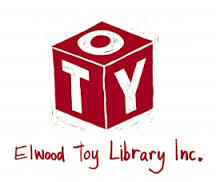 You can find out more about the toy library at Elwood Toy Library's website. Now available - $35 gift vouchers for a three-month trial membership, or to put towards an annual membership to the toy library. Purchase gift vouchers here. Closed public holidays and Saturdays of long weekends. Elwood Toy Library's Terms And Conditions of membership.